English Setter Geschenke - Warnschilder - Aufkleber - Sticker - Pins - Startnummernclips - Feuerzeuge - Krawattennadeln - Schlüsselanhänger u.v.m. 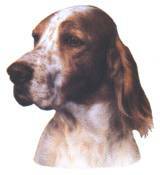 The English Setter has an elegant appearance with a gentle, sensitive and stubborn character. A hound by nature, this dog needs a lot of exercise in order to burn off its energy and to keep fit and healthy. The English Setter also makes a great pet that gets on well with children and likes to be in a family environment. Tragen Sie sich in das kostenlose Züchterverzeichnis unter www.zuechter-net.de/hunde/english-setter ein !